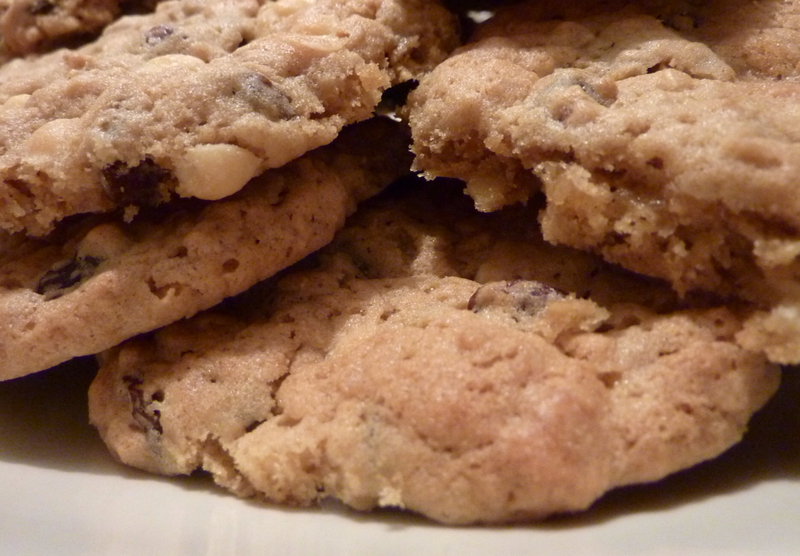 I have recently turned my hand to baking cookies at home. I have always been a big fan of biscuits and cookies, either as a tasty accompaniment to enjoy with a cup of coffee, or as a cheeky snack, but had never tried to make my own before. Last weekend I had my first attempt at making my own cookies. I had found an easy recipe for oatmeal & raisin cookies that I followed to the letter, right up until I put my tray of cookie dough into the oven and I unfortunately overcooked them. My resulting cookies tasted good but were dryer than I would have liked and as a result were more biscuity than I was intending. Undeterred, I was back in the kitchen tonight in the hope of creating something easy yet delicious, and in less than 30 minutes I had created a batch of American style cookies that I know will become a popular addition to my repertoire. Beat the sugar and butter together until light and fluffy, then gradually beat in the egg. Soft in the flour then fold it into the mixture with the oats, raisins and chocolate chips. Drop heaped teaspoons of the mixture onto a greased baking sheets. You will likely need a few sheets to make sure that the cookies have got room spread while cooking. Bake for 10-15 minutes in a preheated oven 180C (350F, gas mark 4). Cool slightly on the trays before transferring to a wire rack to cool completely. The cookies should keep for 3-4 days in an airtight container. Crispy on the outside but slightly chewy on the inside, absolutely delicious! I couldn't believe how easy it was to produce something so tasty and I know that after you've made you first batch that you'll be baking them for years to come. I once made cookies for myself and it was a very bad experience, haha. I will try this recipe out. Thank you so much for the share. Stay blessed.